Almost 10,000 people were still without power on the south coast of B.C. Sunday morning after a powerful windstorm slammed the region. Environment Canada warned of the potential for damage to buildings, as well as for loose objects to be tossed by the wind. A wind warning remains in effect for southern sections of the Island. The national forecaster expected about five to 10 centimetres in the region beginning in the afternoon. Departures as late as 2:10 p.m. were cancelled amid wind warnings from Environment Canada. A special weather statement advising the possibility of snow for Metro Vancouver was rescinded Sunday morning. 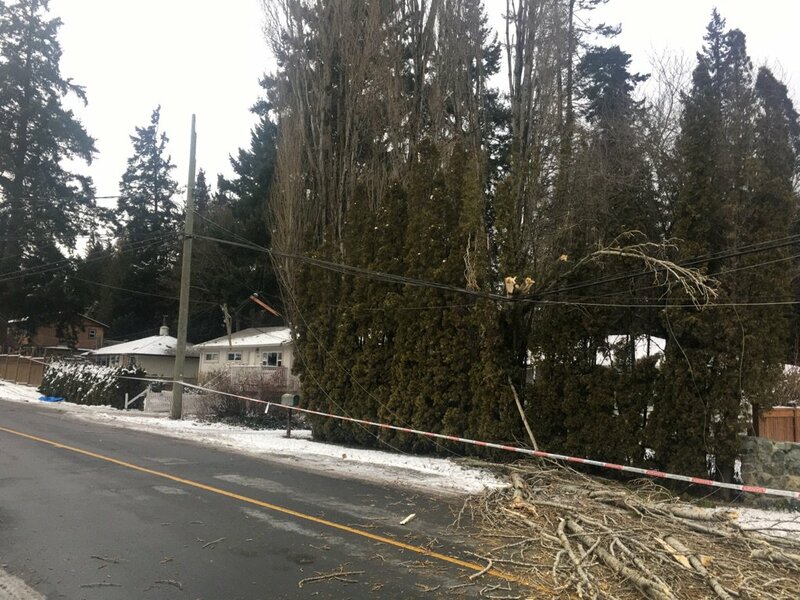 BC Hydro is still cleaning up after a windstorm hit the Vancouver area, bringing down trees and branches and and knocking out power to tens of thousands of homes and businesses. BC Hydro says that at one point on Saturday, the storm knocked out power to more than 70,000 customers. In Chilliwack, a large illuminated sign near the Cottonwood Mall was destroyed. Maple Ridge, Mission and Victoria were the hardest hit areas as of Sunday.